Led Zeppelin will not be playing at the Cardiff Millennium Stadium in Wales - another blow to those hoping the iconic rockers will tour in 2009. Millennium Stadium manager Gerry Toms: "It's dead in the water." 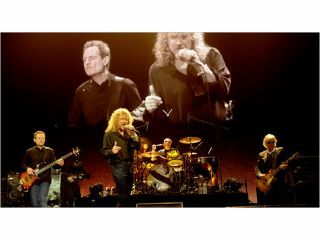 Almost immediately after last December's show, bosses at Cardiff's admitted that they were in talks with Led Zeppelin's management about a 2008 performance. But now Millennium Stadium manager Gerry Toms says, "It's dead in the water. Because the concert was a success there was hope of a tour, but that was a lot of speculation. It would be great if they would, but as far as we know that is dead in the water." Meanwhile, to the consternation of millions of Zeppelin fans, Robert Plant is continuing his hugely successful US tour with Alison Krauss. The two have extended their dates into October.